One of the best ways to save money on those beautiful veggies is to grow them yourself! 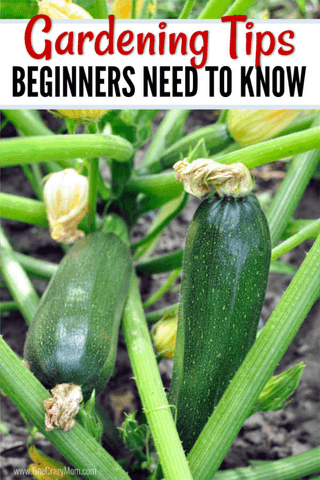 However, if you are a beginner gardener then you might be overwhelmed. As Spring approaches, I can’t help but get excited for farm-fresh vegetables. Gardening is not only fun, but it is healthier. 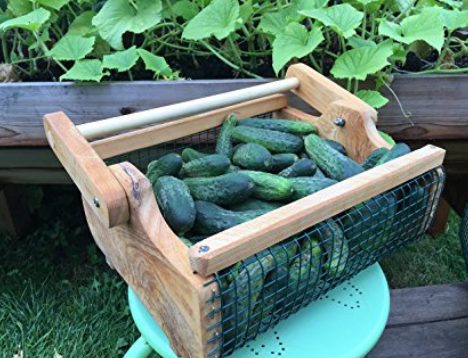 Not only do you control what goes into the soil and on your plants, but it’s a very frugal way to have plenty of vegetables throughout the Spring and Summer months. In fact, your harvest can take you into the winter if you are into canning! 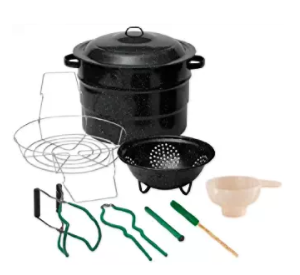 If you are just getting started in canning, you can get a Canning Starter Set that includes canner, jar rack, colander, lid wrench, funnel, tongs, jar lifter, magnetic lid lifter and more! This is a great set for those just getting started and unsure of what all to purchase. Don’t forget to order a case of mason jars for canning. How do you start a garden? We have tips for gardening at home that will tell you exactly how to grow a small garden. From which plants require full sun to the specific growing season, find out all the specifics in this Home Gardening for Beginners guide. Once you find out the top gardening tips, you will be set to starting planting and harvesting! Make sure you know what types of plant grow well in your area. Utilize your local garden center as they are a great source for this kind of regional information. But don’t wait until it’s too late! Get a plan started so you will be ready. When should you start a garden? Typically, you want to start growing your seeds indoors 2 months before your last frost. If you plan to plant your garden early, March is the perfect time to start seeds inside. They will be ready to be transplanted outside for an early Spring garden. The trouble is that if you think you were born without a green thumb, you may think that growing your own vegetables is just too much trouble. Trust me – it doesn’t have to be! There are vegetables that are quite forgiving and are a great place to start as a new gardener. 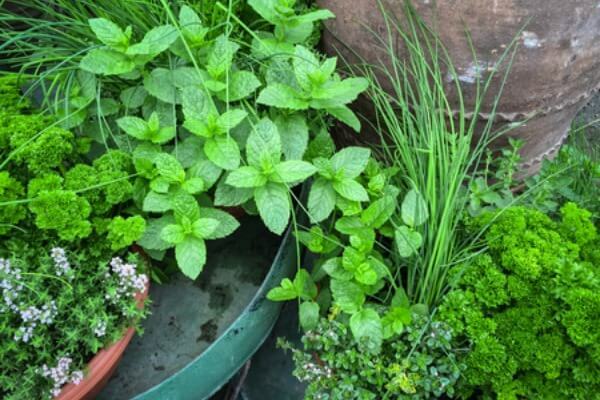 You can even grow in containers if you would rather not create a traditional in-ground garden. Even hanging baskets are options for those without a yard. Tomato plants are good choices! You can grow tomatoes in hanging containers! I like the container here for herbs and tomatoes! Here are some great vegetables to get your garden started. What vegetables to plant for beginners? Some vegetables are easier than others to grow. It’s a good idea to start out with these vegetables when you are first starting out. You can advance to harder to grow veggies later. But when starting out, it’s best to start with easy to grow and maintain vegetables. You don’t want to become overwhelmed! Lettuce, carrots and other root vegetables, tomatoes and green beans are just a few plants that are perfect for beginner gardeners. Start with something you know you can easily grow! Carrots, beets, turnips, parsnips, and radishes are wonderfully simple to grow since the vegetable is the root. You don’t have to worry about staking or caging since they don’t climb. Just make sure you label what you plant and where so you know what you’re pulling up when you go to harvest. Lettuces (of all varieties) grow really well and will give you salad makings throughout the summer. I even recently read that you can put the bottom of a bunch of romaine in a ½ inch of water and it will regrow as you rip off the leaves! This will be amazing with Homemade Ranch Dressing! 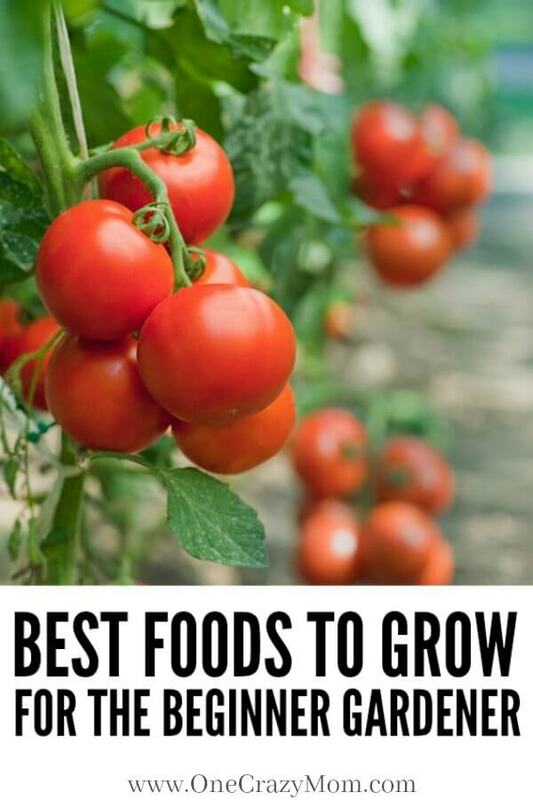 Okay, tomatoes seem like a lot of work, and the bigger varieties like heirloom and beefsteak may be, but if you look for smaller tomato varieties like cherry tomatoes or even some of the newer hybrids that are meant to be grown in smaller spaces, they are really quite simple. 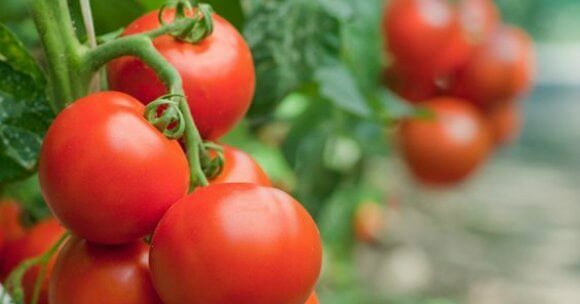 You’re probably better off planting a starter plant that you purchase from the garden department rather than planting from a seed; it can be hard to get a tomato plant to take. Plant some basil near your tomato plants as a natural bug repellent. It also helps to have tomato cages or stakes to keep them off the ground. 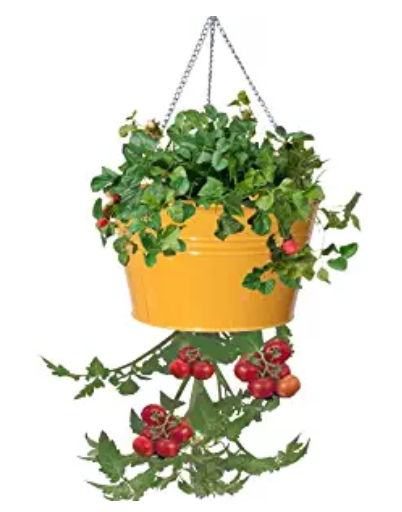 Try these hanging planters for tomatoes if you don’t have any yard space. 4. Green beans (or other bush bean varieties). Depending which green bean variety you choose, you may want to plant them near a fence so they can climb. If you don’t have a fence, look for a variety that doesn’t climb. They are extremely easy to grow, even starting just from seeds, and if you sow new seeds every few weeks, you’ll keep getting lots of delicious green beans. These are also wonderful to can, so keep that in mind if your harvest is getting a little out of hand. Grilled Green Beans are my favorite side dish during the summer months! 5. Zucchini and other squashes. Zucchini tend to take over a bit, and they can get really big – a wonderful thing if you’re into zucchini pie. You’ll have more than enough to share with family and neighbors, too. 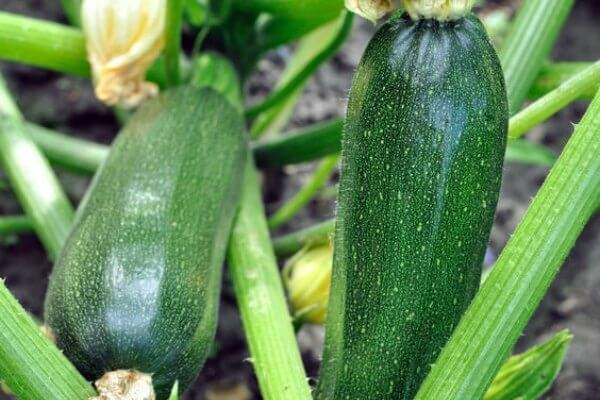 Zucchini and other summer squashes like warm and moist soil, so planting them in the summer isn’t too late! If you have a lot of room, consider planting some pumpkin seeds (also a squash), too – the plant spreads like crazy, but it sure is fun to have home-grown pumpkins come Halloween! We love making Grilled Zucchini Foil Packs! Yum! Many herbs (basil, cilantro, rosemary, etc.) are really simple to grow and are so unbelievably flavorful as compared to their dried counterparts. Start with just one or two, and label them well so you know what’s what. Home Gardening for Beginners doesn’t have to be tricky! Chances are good that once you start a garden this year, you’ll be hooked! Once you taste the delicious bounty of your own garden, it’s hard to go back to store-bought vegetables. Don’t forget to utilize your local garden center. 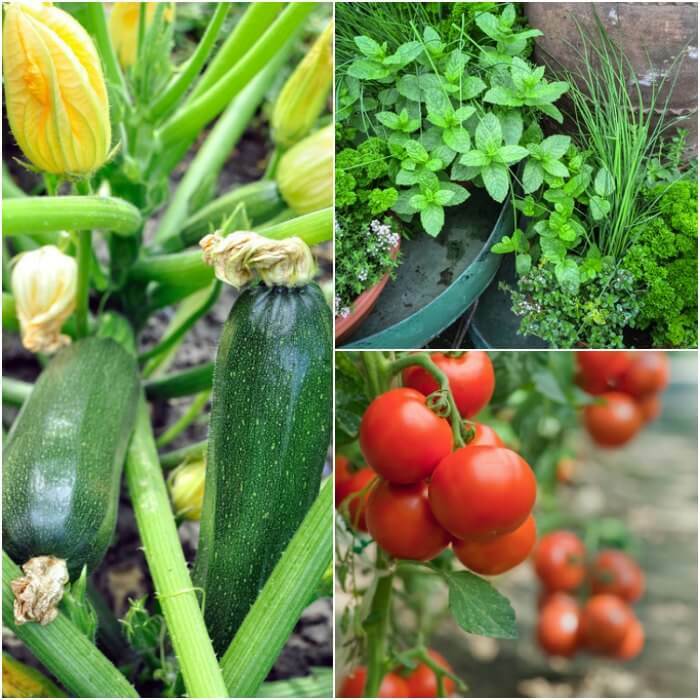 They are a wealth of knowledge and typically very willing to help and offer advice about how to grow vegetables. From raised beds to garden beds, find out what is best for your space. A good rule of thumb is to not grow more than you can handle when you are first learning to grow a garden. It’s easy to become overwhelmed so best to start out slow. You can even make your own Fruit and Vegetable Cleaner! I just love being able to control what is going on my food! Find 5 more Easy to Make Fruit and Vegetable Wash ideas here. Enjoy, and be sure to come back and let us know which was your favorite vegetable to grow! I know I can’t wait to make these Grilled Zucchini Foil Packs Recipe! Oh and Easy Cucumber Tomato Salad Recipe is SO amazing with garden fresh veggies. I can’t wait! What do you plan to cook with all of your yummy garden vegetables? Oh and don’t forget to make sure you have a basket or container to collect your harvest! Once the veggies start coming in, you will be busy picking vegetables. I have a basket similar to these. The kids also have a smaller one. They love to help and the smaller ones are perfect for them to carry.